Are you still gathering risk data from the business in spreadsheets and emails? The dual objectives of having to perform risk management better than ever before whilst at the same time reducing costs, means that the only way of achieving this is through increased levels of automation. Stand-alone spreadsheets, word documents and siloed PC based risk systems detract from both of these objectives and therefore need to be replaced. Yet, the challenge of how to solve this remains. Whilst as a risk professional spending time on risk analysis and communication would be more valuable than on data collection, we also need to consider the risk owner – the business employee or person who is required to do most of the identification, assessment and mitigation. Someone who owns a risk, and is responsible for its potential impact against their objectives, doesn’t always have Risk in their title and they need to update their risk information quickly, and continue with their day job. If it’s not quick and easy, they won’t use a central risk system, or worse still – they won’t do it at all. Watch this video and see how Risk Express can help your business. ARM Risk Express is designed for Risk Owners to participate in the risk process through an easy to use interface designed specifically for them. This fits into the suite of user interfaces supported by Active Risk Manager for different risk user communities to enable full enterprise risk management to occur throughout the organisation with the right user interface and the right information for the right role in a single solution. ARM Risk Express allows business users to update their risks, scores and actions in a matter of minutes without help or additional data manipulation – allowing the Risk Group to spend more time on critical analysis and interpretation to senior management. 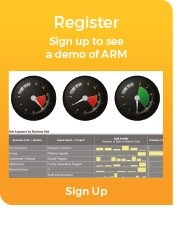 ARM Risk Express has been designed, tried and tested for ease of use by a range of business users. It is the most intuitive interface we’ve ever developed and runs on any browser, allowing access from mobile devices, laptops or desktops. It is the solution that automates users away from Excel and encourages participation on an efficient single risk management framework. ARM Risk Express helps owners of risks to see the value of the Risk Management process they are inputting to by highlighting progress in easy to understand graphics and filters. ARM Risk Express provides the Risk Owner with a simple list of their risks and actions that they can update directly and simply in a smart grid, without searching for their data or requiring specialist software training. As part of an integrated solution to enterprise risk management, Risk Managers have access to this information in real-time from across the business, without needing to train a single user or make any data updates on behalf of others. This allows the Risk Group to concentrate on the Risk Process and outputs rather than data. ARM Risk Express contains all the validation and static data from the enterprise database in a smart easy to use grid. No more annoyances with Excel, out of date and inconsistent information, incorrect versions and backup issues. Everyone shares a common view and assessment of what risk means to the business. ARM Risk Express is the solution that finally enables both objectives of quality risk management and cost reduction to be achieved by targeting the elimination of Excel and Word based risk data.